The European variety of honey-wine seems to get the lion’s share of press, but it isn’t the only variety. Honey is available all over the world, and humans are good at figuring out what we can turn into alcohol. Tej is one such example: a honey-wine of Ethiopian and Eritrean origin. It can alternatively be spelled as te’j or tedj. Like its mead cousin, it, too, is made up chiefly of honey, water, and yeast. Where it differs is in its use of gesho as a bittering agent. 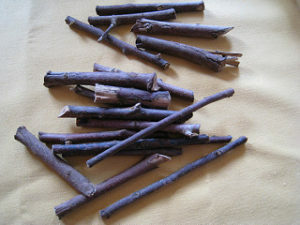 Gesho is a spice like substance derived from the bark of the gesho tree. It serves as a bittering agent in much the same way that hops is used in beer. In fact it is often referred to as either “Ethiopian hops” or “woody hops”. Geshos leaves are used as a flavoring to Ethiopian beer while the branches, bark or shavings are reserved for tej. I had my first opportunity to try it recently while on vacation in Orlando. Nile Ethiopian Restaurant serves some, although it is not listed in their menu, so you may need to inquire about it if your server doesn’t mention it. Despite the similarity in ingredients, it was a very different experience from the European style meads I had tried and made myself. Put simply, it was delicious. The tej I tried was quite sweet, but not in a cloying, sugar candy way, more akin to fruit. It was almost citrusy, even. It was bursting with flavor, and had a definite spice/herbal flavor to it that I was unfamiliar with and can only assume was the gesho. It even felt like it was on the verge of being fizzy, although not enough to be visibly so. My girlfriend also enjoyed it, as it did not have a very noticeable alcoholic flavor to it. She described it as a hard British Fanta, reminding her of one of the other citrus varieties of the soft drink. It was an opaque, but surprisingly bright yellow color. The drink came in a really interesting glass as well, which looked more at home in a chemist’s lab than a restaurant. It appears that’s a fairly commonly shaped vessel for this drink known as a berele. I found it a tad unwieldy to drink from, but I think it added to the experience overall. I am unsure of quite how strong the drink was. My guess was it was close to the equivalent of a big brand name beer. The liquid had significant body to it (meaning lots of sugar present), and it was unfiltered, so they didn’t remove the yeast to stop the fermentation from continuing. Tej recipes tend to show a pretty quick turn around on the production process. Usually they are drinkable soon after fermentation completes – which indicates it is a lower ABV that didn’t require aging to mellow out the alcohol bite. The food itself was also very enjoyable. I recommend visiting if you have the chance. 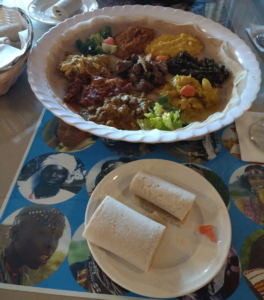 If you’ve never had Ethiopian before, it can be quite the experience. There are no utensils involved, those small rolls of a thin bready substance are how you pick up and eat your food. Some of the flavors are reminiscent of curry, in my opinion.